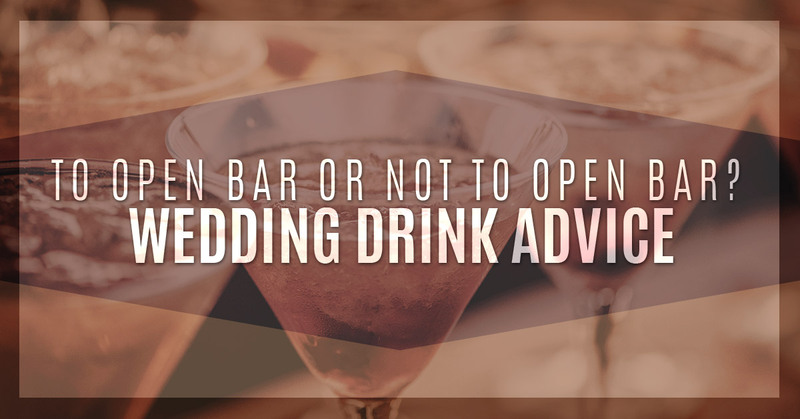 When it comes to the actual experience of your wedding for guests, the beverage situation is one of the most important. Depending on your style and the type of guests you’re inviting to your wedding, there are varying options for beverage service. Consider the advantages and disadvantages to these common beverage service options as you and your partner make a final decision. If you have a group of friends and family that likes to party, open bar is practically an expectation. After all, your guests are spending money on travel, lodging, clothing, and gifts for the big day, so they tend to assume that food and alcohol will be provided. The benefit of an open bar is entirely guest experience. People don’t need to worry about having cash or cards on them, and they tend to loosen up on the dance floor. Price is an obvious downside of an open bar; even if you provide average liquor, wine, and beer, the cost of alcohol adds up. Additionally, open bar weddings are much more likely to get sloppy. If you think your guests might abuse this service, consider an alternative instead. If you know you don’t want to do an open bar or can’t afford the price tag, having a beverage happy hour is a great alternative. People can get wine and beer (and cocktails, if you choose) before sitting down to eat. At a set time (after an hour, or so), you can make it clear to guests that drinks are now for-purchase. For daytime or more casual weddings, this option is nice because guests can go up and replenish their drinks after the free service ends. If you’re planning a more formal wedding and sit-down dinner, you’ll want to think about how guests will drink refills while they eat. Another hybrid option involves having two designated drinks — one for each partner. Guests can get these options for free throughout the entire wedding. This option becomes affordable because of economies of scale. If you’re making Moscow Mules, you can load up on vodka, ginger beer, and limes without the hassle of supplying a full wet bar. If supplies of the drink run out, guests will have to purchase other drink options. Another downfall involves those who would rather drink wine or beer rather than hard liquor. Our last suggestion involves using a drink machine to churn out frozen beverages, such as margaritas. This way, you have a playful addition to your wedding, and guests can stock up on this option without worrying about going to the bar. At Alegria Gardens, we have a margarita machine available for weddings and receptions at our venue! Alegria Gardens is a premiere reception hall in Katy. We host weddings, quinceaneras, graduations, baby showers, birthday parties, and other special ceremonies. For weddings, we also offer catering, limo, cake, DJ, and photography and video options. Call us today to learn more about our wedding venue in Katy!